Ivan Lendl, Andre Agassi, Pete Sampras and John McEnroe at the pre-match press conference. John McEnroe and Ivan Lendl will square off in the opening match of the BNP Paribas Showdown. Pete Sampras and Andre Agassi will meet in the final match of the evening. NEW YORK -- Pete Sampras, Andre Agassi, John McEnroe and Ivan Lendl were all the No. 1 players in the world during their illustrious careers, all won multiple Grand Slam tournament titles and, when Agassi is inducted this summer, all will be members of the International Tennis Hall of Fame. They have nothing left to prove in their games, but make no mistake, when they compete in the BNP Paribas Showdown at Madison Square Garden tonight as part of Tennis Night in America, each player wants to win. McEnroe and Lendl renew their rivalry from the 1980s first at 7 p.m., which can be viewed on ESPN3.com, with the first player to win eight games taking the match. Sampras and Agassi then follow at 9 p.m. on ESPN2 in a best-of-three-set match. In a light-hearted morning press conference at the Jumeirah Essex House in Manhattan leading up to the evening’s matches, the players discussed their impending matchups and another critical component of Tennis Night in America, which is to get more kids playing tennis. In addition, for the first time ever in a nationally televised professional match, the players will compete on a court with 60-foot blended lines, for 10 and Under Tennis, on a 78-foot regulation court. Blended lines are painted in a different, more subtle color than the traditional lines, enabling courts to be adapted for competitive play for younger children. 10 and Under Tennis, featuring the QuickStart Tennis play format, scales the game of tennis down to the size of the child, utilizing not just a smaller court but smaller racquets and lower compression balls, as well, that make learning and playing the game easier and more fun for children. In conjunction with the BNP Paribas Showdown, the USTA is hosting over 700 youth registration events at tennis facilities across the country to sign more children up for tennis programming. Perhaps more children will be inspired to pick up a racquet after watching four tennis legends battle at the world’s most famous arena, where they will be treated to some entertaining tennis between great players with entertaining personalities. 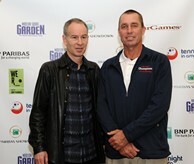 "Having grown up in Queens and lived in Manhattan the past 30 years and as a frequent visitor to the Garden, going to my first hockey game, basketball game, concert at the Garden and also having the great year-end tennis event there, it would be an understatement to say I was not pumped up to have this chance," McEnroe said of the BNP Paribas Showdown. "I never thought I would have the chance to play Ivan because he did not play a match for 16 years, faking that back injury," he joked. And Lendl was quick to respond to McEnroe’s playful jab. "John, remember, we are all happy to be here. If you see what you perceive as a bad call, those linespeople work for me, too," Lendl, 50, joked. "I figured out, that goes without saying," McEnroe responded. "Is there a challenge system tonight?" Replied Lendl to laughter from the crowd: "Yes, you appeal to me." "I aim for the center of the court, anyway," McEnroe, 52, replied. "I am just happy when it goes in. You don’t have to worry about going down the line." Agassi and Sampras also reconfirmed that they have patched things up from an unfortunate on-court incident during the Hit for Haiti exhibition last March, when the pair traded some verbal jabs. Agassi apologized to Sampras, and the two have moved on and played a few exhibitions since. "Strictly platonic," Agassi joked when asked about his relationship now with Sampras. In their illustrious careers, Sampras holds a 20-14 advantage over Agassi in career head-to-head meetings, with the last coming in Sampras’ final match when he defeated Agassi to win the 2002 US Open and then retired. Sampras is also serving as the spokesperson for Tennis Night in America, and while he hopes for a great match on the court, he also hopes it will inspire some young kids to pick up racquets. "I think it is very important to get kids playing tennis at a young age. We are playing on a court tonight with blended lines," he said. "We need to put some racquets into these kids’ hands that are easier to play with. Young kids are picking up baseball bats, and we need to get them playing tennis, and we have to start young. I started playing when I was seven." And while the players hope the capacity crowd at the Garden enjoys the competition, they are thrilled to be there, as well. "Who would have thought I could sit here with these incredible champions?" McEnroe said. "And then being able to step out on Madison Square Garden is amazing for all of us."